Once in a while I'll be stopped at a stoplight and will glance at the other drivers and wonder about them. Where are they going? What is their life like? And, quite often, what would life be like if we weren't "trained" to be in competition with each other? Get better grades, score more goals, run faster, jump higher, get accepted into a more prestigious college, get a higher-paying job, etc, etc. Is there anything in life that doesn't focus on celebrating winners and chastising losers? Fortunately, there is. While the overwhelming majority of games are designed to have one victor and one (or more) person left in defeat, I love that there are companies like Peaceable Kingdom that not only create products and games that educate and inspire, but promote cooperative play! An expert in juvenile product development, Peaceable Kingdom is a leader in stickers, greeting cards, and games. As their mission is to make good, do good, and be good, they continually focus on fresh, fun and award-winning products, donating to charitable organizations that support the well-being of children, and using sustainable, eco-friendly materials whenever possible. Along with their amazing past products, Peaceable Kingdom recently launched a new selection of fun and challenging games that foster the importance of playing together rather than beating your opponent. Why deal with the stress and consolation of a traditional game when your entire family could enjoy playing What's It?, The Great Cheese Chase, Buzz! or Stack up! instead? While both of my girls were immediately pointing out whimsical illustrated characters on the What's It? box, I was impressed with the overall concept. Instead of playing against one another, this cooperative game emphasizes play and collaboration to beat the Doodler as a team. 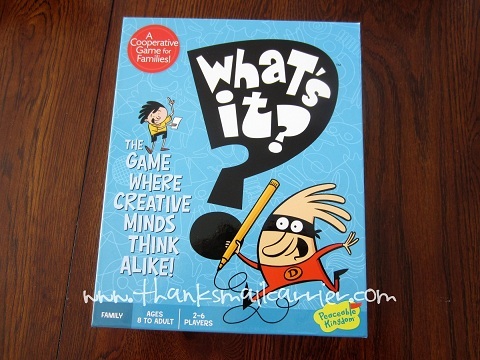 While this game is recommended for ages 8 to adult (requiring 2 – 6 players), I had no doubt that my 4- and 6-year-olds would enjoy the creativity and fun of trying to work together to decipher each image. The round began with the flip of a doodle card and starting the timer (although we tried not using the timer as well due to the girls' young ages and the amount of time it takes them to write out words), and then each player using their own answer board and dry erase pen to write down three answers as to what they believed the pre-printed doodle looked like (in the specific category rolled on the die). This game really is a lot of fun! Similar to something like Pictionary, where there is a great deal of laughter involved as you try to decipher what someone else is thinking, What's It? has the same guessing hilarity! Unlike other games that end with one or both girls sad and disappointed, What's It? promotes the idea that, by having all players work together, everyone can win! Add to that the fact that it is just a whole lot of fun to come up with all sorts of zany answers and my girls have asked to play this game again and again and again! With competition such a big part of our society, I'm happy to see that there are companies that have found a way to boost the confidence, cooperation and teamwork of children of all ages. Retailing for $24.99, I have no doubt that we will be reaching for What's It? by Peaceable Kingdom for many more game nights for years to come! At the same time, for more individualized extensive play, we have been thrilled with the way that Peaceable Kingdom's new Sticker Books have taken a seemingly simple concept and turned them into something so much more. From glow-in-the-dark to 3D to stickers that flicker and change as you move them, these are beyond what a traditional, use-one-time-and-then-it's-thrown-away sticker can do. 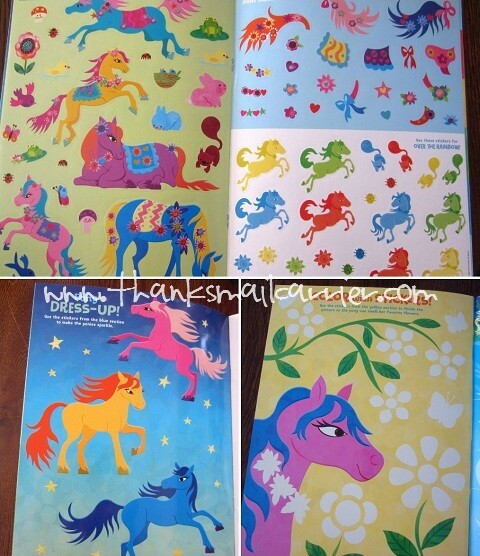 While I had assumed that both of my girls would enjoy the Magical Ponies Sticker Activity Book, I hadn't realized just how much they would be thrilled over the vivid colors, whimsical illustrations, and all-out uniqueness of this book. More than simply a few pages with some stickers, this activity book contains six different pages of activities (e.g. pony dress-up, a puzzle and color matching) and four sheets that are filled to the edges with all sorts of repositional stickers. I love the way that Peaceable Kingdom has incorporated an educational aspect to this book, and especially adore the fact that these stickers can be peeled from the pages and used again and again. 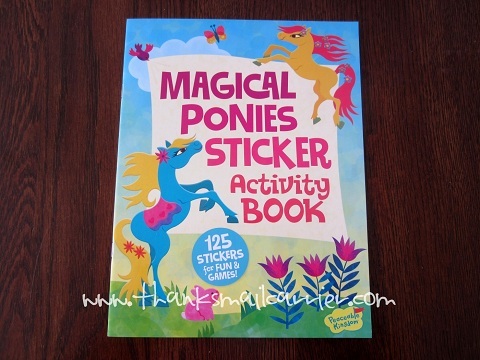 Instead of a traditional activity book in which the stickers are permanently adhered to the paper pages, these magical ponies (and the zillions of other stickers) can be moved around for endless adventures and play! 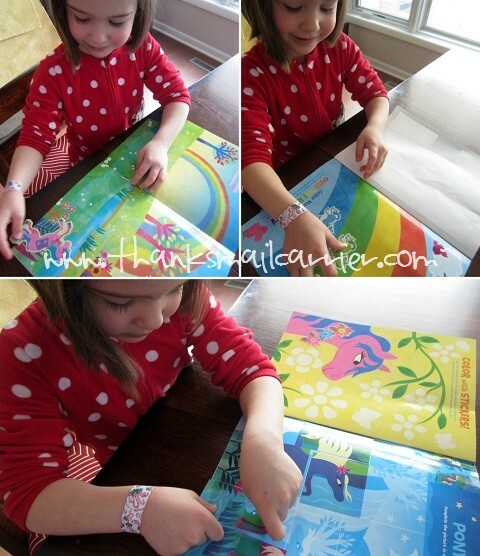 Retailing for $7.99, these Peaceable Kingdom Sticker Books (as well as the other varieties of unique sticker fun) are available in all sorts of fun themes — monsters, princesses, dinosaurs, aliens, fairies and more — and make a perfectly affordable and entertaining gift for any occasion. 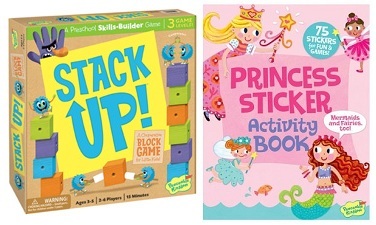 If you're looking for a captivating game that promotes working together or a clever activity book that can reinforce imagination that the children in your life are sure to enjoy, visit the Peaceable Kingdom website to see their expanding product line and the education and entertainment that they can bring to your home. One lucky person will win their choice of Peaceable Kingdom's 2013 games or sticker books*! A big thank you to Peaceable Kingdom for providing What's It? and Magical Ponies Sticker Activity Book for me to review and the choice of 2013 game or sticker book for one lucky giveaway winner. The opinions shared are my own and honest and if you really need to see more, click here to see how I roll. I really like the write and wipe books :). I like the Monster Car stickers. I like the Feed the Woozle game! Hoot Owl Hoot! Cooperative Board Game looks like fun! hoot owl looks so cute!!! I like the Cars & Trucks Big Sticker Book . 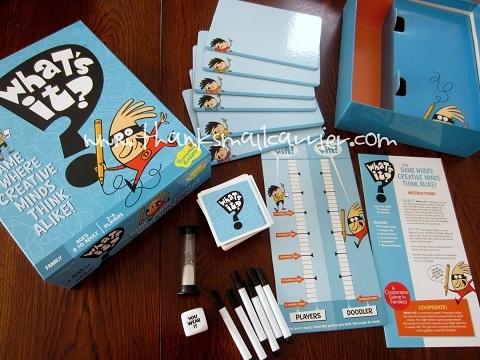 My son would love the Secret Agent Write & Wipe Activity Book! Race to the Treasure Cooperative Board Game! I like the Owls Lock & Key Diary. Their Lost Puppies games looks like fun! I'd love to get the Stone Soup game. My daughter would love the "Lost Puppies" board game, and my son would love the "Feed the Woozle" board game. They look really fun! 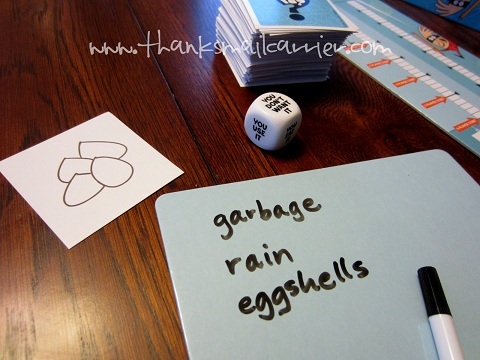 I enjoy playing cooperative games with my grandchildren so I would love the Stone Soup game. Feed the Woozle looks like fun. Sounds like it too! I thought the Hoot Owl Hoot game looked fun. I'd like to try Hoot Owl Hoot! Cooperative Board Game since we all love owls around here. The This or That game looks fun! I think I would get the "This or That" game for girls. I know a group of gals who I envision liking this! I'd like to try the Feed the Woozle game. Stone Soup looks like fun. I like the animal sounds matchup game. I like the Really Ridiculous Write & Wipe Activity Book. 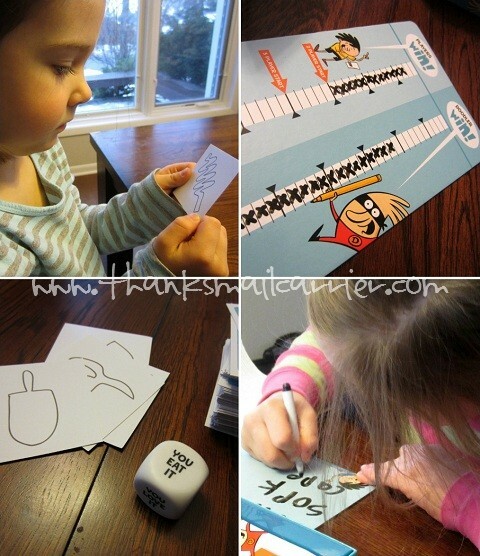 I also like the Secret Agent Write & Wipe Activity Book! I like the write and wipe books. I would like to win The Cheese Chase for my Grandson. Thank you! The stone soup cooperative board game looks cute. My daughter likes the Mermaids In-a-Box. I love the animal alphabet match up game. I love the sticker activity books! The Stone Soup game looks cute! I also like the Old Maid and Crazy Mates card games. I like the Lost Puppies game. I like the Lost Puppies Cooperative Board Game. Those birthday cards are too cute. The new for 2013 3-D Stickers caught ay attention. The Flippity Frogs Board Game looks like a ton of fun. Feed The Woozle caught my eye!! I like the Write & Wipe books. I like the Monster Sticker Activity Book. I like the Puppy Lock and Key Diary. Mermaid Island Cooperative Board Game looks fun. I bet my son would love the Secret Agent Wipe Off book. I like the This or That? Just for Girls! The Hoot Owl Hoot! Cooperative Board Game looks very fun.